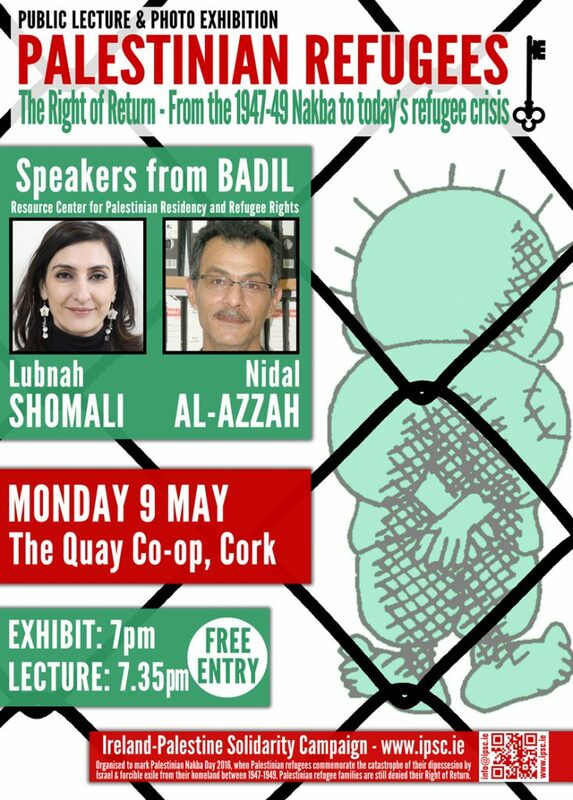 To mark Nakba Day 2016 the Ireland-Palestine Solidarity Campaign is honoured to present Lubna Shomali and Nidal Al-Azzah from BADIL , Resource Center for Palestinian Residency and Refugee Rights. They will speak on Monday 9th May in the Quay Co-op, 24 Sullivan’s Quay, Cork at 7.30pm. There will also be an exhibition of photographs which can be viewed from 7pm. Their talk will be a first-hand account of the key issues regarding Palestinian refugees, from the 1947-49 Nakba when over 700,000 Palestinians were forcibly dispossessed and exiled from their homeland to facilitate the creation of the state of Israel up to the refugee crisis of the present today. BADIL Resource Center for Palestinian Residency and Refugee Rights BADIL is a Palestinian human rights organization established in 1998, dedicated to defending and promoting the rights of Palestinian refugees and internally displaced persons (IDPs), regardless of their geographic location, according to the frameworks of international humanitarian, human rights and refugee law. BADIL is one of the leading and respected resources on historic and contemporary forcible transfer and the Palestinian refugee and IDP issue. BADIL has special consultative status though a partnership framework with UN ECOSOC, allowing it and its partners to engage regularly and assertively with all UN mechanisms. BADIL works to engage and empower Palestinian and international civil society to advance a rights-based solution according to international law. Nidal Al-Azza is Director of BADIL and human rights defender who has been working with BADIL since 2006. He occupied many core positions including the Coordinator of Resource, Research and Legal Advocacy Unit (2008-2013), and the Director of BADIL since 2014. He teaches International Refugee Law at al-Quds University, the leading editor of BADIL’s core publications and periodicals Mr. Al-Azza participated in and represented BADIL in numerous international conferences and forums, is a co-founder of The Lajee Center in Bethlehem’s Aida Refugee Camp and a member of many human rights organizations, community based organizations and coalitions. Lubnah Shomali is BADIL’s Administrative and Financial Affairs Manager. As a Palestinian human rights defender and activist, Mrs. Shomali will present BADIL’s comprehensive rights-based approach to the Palestinian-Israeli conflict, with a focus on forced population transfer, refugees and internally displaced persons, according to international humanitarian and human rights law. Mrs. Shomali relocated with her family to her hometown in the West Bank in the summer of 2008. She worked with Beit Sahour Municipality for three years as their International Relations Officer before signing on with BADIL Resource Center in 2012.